On 29th April’17, April 8 different meetup groups of Bangalore came together and did joint event on Microservices and Serverless. 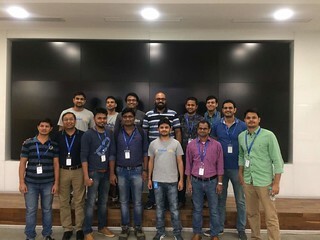 The 8th meetups groups were AWS, Azure, DevOps, DigitalOcean, Docker, Hybrid Cloud, Kubernetes and Mesos Meetup groups. It was like a mini-conference :). ~250 people registered and from them ~200 came, which is pretty good turn around. More details about the background of the event is here. 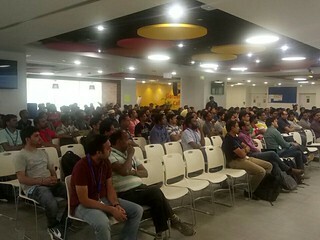 The event was hosted at Walmart Labs, India. They sponsored food and made excellent arrangement for the event. Everything went smooth and on time. We had great line of talks for the event. I think Ken Sipe’s talk on DC/OS and Shiju’s talk on Microservices were the highlight of the event. Due to some confusion my talk was not recorded. I gave a demo of FaaS by Alex Ellis, using a custom twitter function. Thanks to all speakers for sharing their knowledge with us. From the collected fee we would be giving a gift voucher of INR 1500 each to our speakers. After all the sessions we had Q & A session with the participants as well. Participants who gave right answer, got a t-shirt from DigitalOcean and would be getting a gift voucher from the collected fee as well. I would like thank organisers of different meetup groups Habib, Jasnoor, Aditya, Mohit, Kumar Gaurav, Krishna M and Madan on coming together for this event. And thanks for the team of Walmart India Deepak, Sunita, Gopal, Nitin and other volunteers. We could not get everyone in same frame but here is picture of the team, who made this event possible. I hope participants learned something new and will look forward to be part more such events in future.